Re: Portland: Rose City [D, GP] (v 17, pg 7) what's next? Okay, fair point. Land bridges are gone. Anything else I need to tweak on here? I guess I keep fiddling with it and adding stuff because it feels like this map is kind of just stuck. Is there anything to be done to move this onward or is it doomed to lack of community interest? Are St. John's and Forest Park connected? If so, perhaps you should place the bridge on top of the impassable rail line to make that less confusing. I'm glad you got rid of the land bridges - as per ian's point- the Bike Lanes are more likely to be a feature now. Revisiting the map afresh I think the only uncertainty a player would experience is the bridge border discussed above. 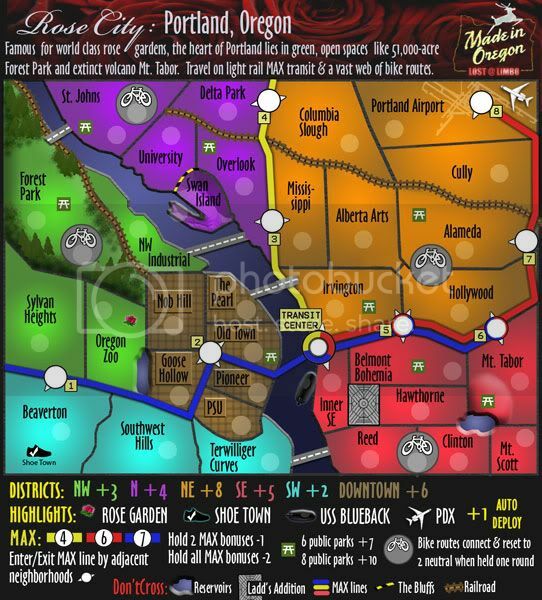 Wow just noticed this map this looks great I really like the bike routes which reset to neutrals after each turn. However I do miss the old style bridges you had on the first versions I thought those were great looking. Just letting you know i'll be stamping this map for graphics. Sorry it took me so long, but i'm here now . I have a few nitpicks that i think will improve the map, i don't think you're too far from getting the graphics stamp. Forest looks great, really suits the design of the map, well done. I think the heading could be a little more appealing, it's called Rose City so maybe a fancy font with roses weaved in and out of the letters might look nice. Swan Island looks like it's been punched in or something? Why doesn't it look like the rest of the mainland? USS Blueback i think could look more like a ship and less like a black blob with a white outline. See cairnswk's Pearl Harbor map for an example of how the ship could look from an aerial view. Also what does OMSI stand for? Are the train tracks supposed to just stop? I know they are just impassables and nothing more. However it seems a bit strange, perhaps putting a train station at the end to signal the end of the train track. In real life train tracks don't just cut-off in odd places. Just a though, you don't have to if you don't want to. I think the park benches look nice. 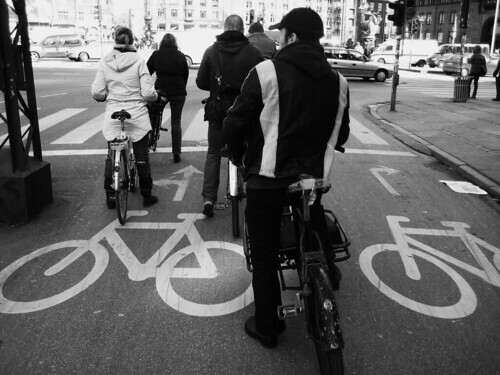 However i think the bike routes could look a little better, more so the icons, could have a better picture of a bike. But that is just a personal opinion. In the Downtown bonus, the lines are not evenly across. e.g. Nob Hill has some lines all bunched up to the right and more spaced out to the left, just looks a little strange, if it was all the same it would look a lot nicer. Also PSU doesn't have any lines on it? Also what is the point of having a bridge from St.Johns to Forest Park if it's blocked by a Railroad track? What is the picture on Portland Airport/Cascadia, it looks a little out of place? samuelc812 wrote: Sorry it took me so long, but i'm here now . I have a few nitpicks that i think will improve the map, i don't think you're too far from getting the graphics stamp. I'll play around with that. I was going for a guide book look with this version. Swan Island is a land island - a long cliff separates it from University & Overlook in reality. Earlier, I had made the "Bluffs" impassable, so that Swan Island was only accessible from NW Industrial, but I found it to difficult to illustrate this impassable on the map, so I dropped it, but left the visual effect for accuracy. Now that I think about it, maybe I'll bring back the impassable element. The USS Blueback isn't a ship - its a submarine. The visual is supposed to illustrate a sub just barely peeking out of the water. The white outline helps to differentiate it from the dark blue water and also to tie it in visually with the rose gardens and Shoe Town as a bonus group. OMSI stands for Oregon Museum Science & Industry - which hosts the Blueback and is a riverside attraction in its own right. Maybe I'll drop the OMSI part since it is confusing and too big for further explanation on the map. I'll try to blend these in better somehow. They kind of just disperse in industrial areas. This was just another visual touch to roughly illustrate how the blocks get longer in downtown NW, but I have no problem making it more uniform. PSU is a university campus, so no roads there. I'll fix this. The old bridge clearly connected the two, but these new bridges don't look right to me (I hate the Irvington overlap) and I haven't figured out how to fix this yet. I elected to leave the Downtown streets as is, because I like the authenticity and adding train stations or warehouse where the train tracks end seemed to only add clutter, so I left them as was, but I fixed or improved some of the other things you mentioned. Added train track impassable and softened edge of Swan Island. Toned down highlights for other Attractions bonuses. Added more detail to USS Blueback submarine. Added rose background and fancy title font back into header. This map is vastly superior to some of your earlier drafts - you've done a really good job here. 1. The railroad border between Swan Island and University looks a bit out of place, given that it is so short and doesn't connect to/with anything else. I think you could quite easily lose that as an impassable without any detriment to gameplay - the other option would be to link the railroad to another track, but that would be really difficult on the eye. 2. There appears to be a slight inconsistency with the thickness of you territory border lines, and personally I think they're a little too thick. 4. At first glance, the blue MAX line looks like a river in the Beaverton area - is there any chance you could add a drop shadow in the same way as you have done with the road/bridges? I think the real concern is that the dedge by Beaverton is a bit fuzzy, and not as crisp as I'd expect it to be. As I said at the beginning of this post; the map is looking really good now. Love the way you made logo of the map with Made in Oregon and your nick inside. I liked previous bridges more too. 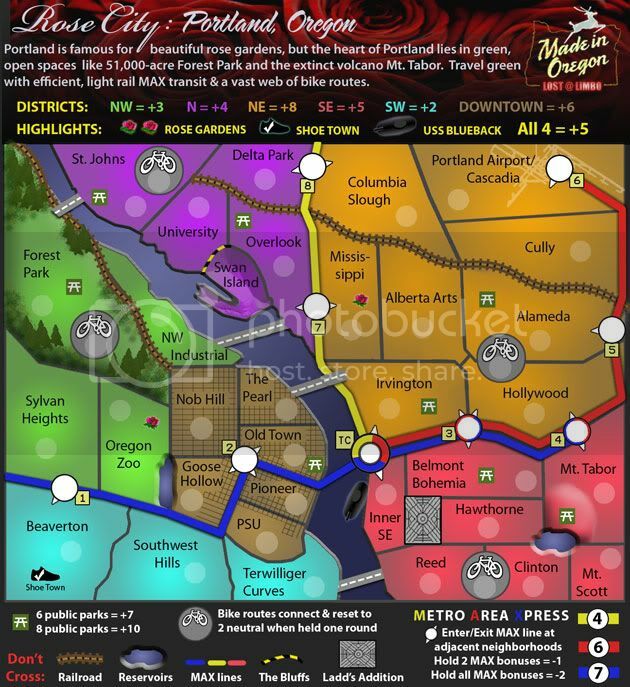 But well at least we can see them in real and hopefully play P-town map in here very soon. MrBenn wrote: This map is vastly superior to some of your earlier drafts - you've done a really good job here. I dropped the railroad, but would like to keep this true to life, so I replaced it with the cautionary retainers you see along the bluffs between University & Swan Island (or any sharp, precarious drop). This would require a complete re-draw of the map, essentially from the beginning. I simply do not have enough time to do something like this at the moment or in the forseeable future. I'm not opposed to it, but its going to take a while. I tried to sink the reservoirs a little bit more. Does that help? If I do another draft, I may add a border or something around the edges to make them look less lake-like and more reservoir-ish. I also toned down the Mt. Tabor volcano. I left some contour, because I talk about Mt. Tabor in the intro and it is one of Portland's unique attributes, so I like the idea of displaying it visually. I tweaked these a little. Better? I did re-order these, but a little differently than you suggested. 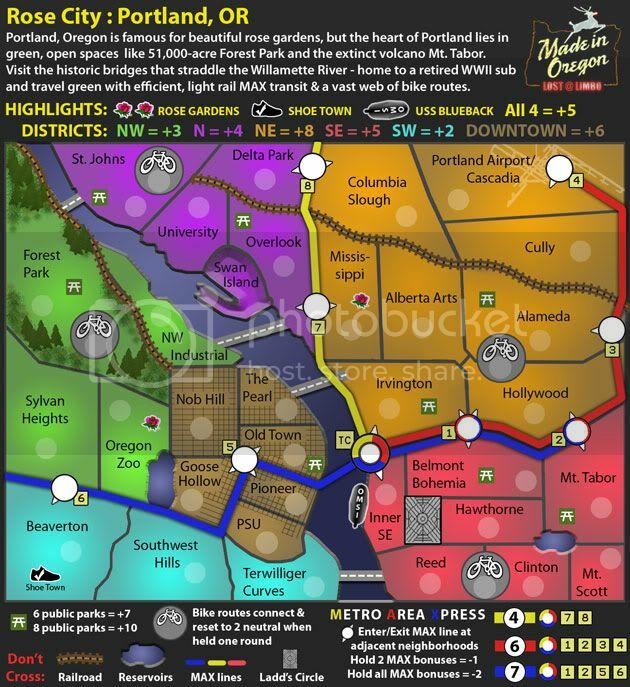 This makes more sense in Portland terms as the Yellow MAX line was a later addition to the others. As to the legend, I added the "TC", but then dropped that part altogether to make some more space down there. I think the MAX bonus is explanatory enough with the colors alone. If you disagree, I'll try to squeeze it back in somehow. A better font would do wonders for this map. The font you currently have is just way to plain and doesn't do the map justice. Perhaps something a little more scrolly? Hi all - new draft coming soon. Will try some different fonts. Tried to make this one less flat. Found a different font I like. Re-did the Downtown street grid. 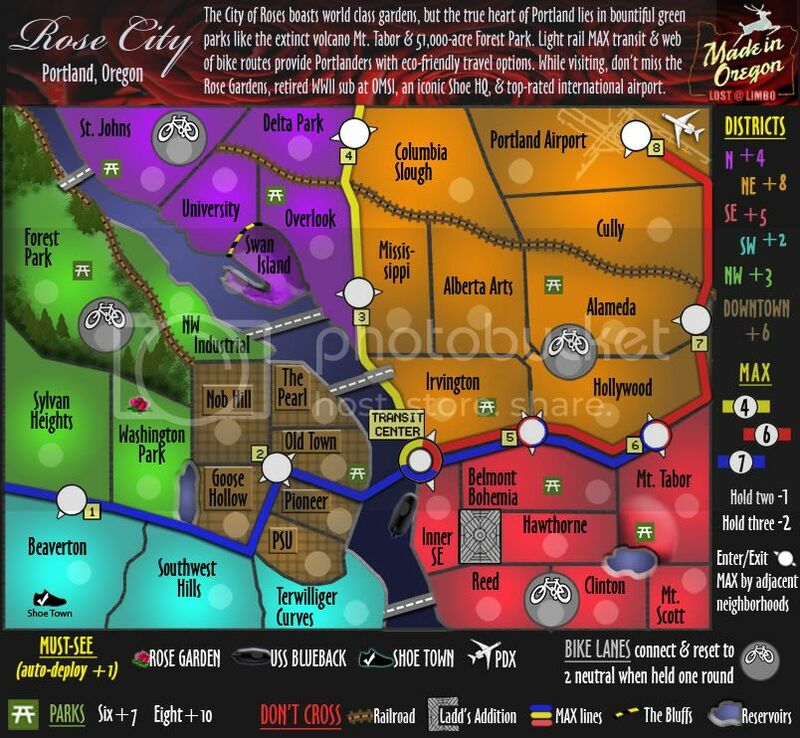 Added the airport as a Highlight and dropped a rose garden. Perhaps it is too late in the process, but I wanted to float the idea of the "Highlights" starting neutral and then being +1 auto-deploy when owned. Among other benefits, it makes it impossible for a player to start with the SW or NW bonuses. Thoughts on this change? Myself and thenobodies80 noticed no new updates for this map since 10/30/09 and was about to issue the 1 review warning before being sent to the Recycling Bin. But with lostatlimbo posting a new update just today we can say he'll be continuing production. Get some updates and community feedback into this map and you'll get a graphical review from us next fortnight. RedBaron0 wrote: Get some updates and community feedback into this map and you'll get a graphical review from us next fortnight. It seems like whenever I post an update, I only get one reply (if that). I've tried advertising it in my signature and I used to be very active in the Foundry forums giving my input to others, but couldn't seem to get much reciprocity. Very frustrating to spend so much time working on this map to so little interest. I do have some other minor tweaks I'd like to make this weekend, but in the meantime, if anyone's listening, I could really use some input on whether or not the suggestion to change the "Highlight" bonuses to neutrals & +1 autodeploys is going to throw a wrench in the gameplay or not. In my opinion, I think the pros outweigh the cons, but I'd like to hear from others. If the consensus is not in favor of the change, I may just drop the "Highlight" bonus altogether and de-clutter the map a bit. lostatlimbo wrote: Perhaps it is too late in the process, but I wanted to float the idea of the "Highlights" starting neutral and then being +1 auto-deploy when owned. Among other benefits, it makes it impossible for a player to start with the SW or NW bonuses. Thoughts on this change? Looking at the map I would tend to agree with you in starting the Highlights neutral then having them as the +1 auto. It would diffidently prevent someone from dropping those bonuses right off the bat. I think a you could go with the standard 3 neutral or IMO, start them with a 5 neutral to prevent someone from getting those bonuses right on their first turn. Keep up the good work, and I'll be poking my nose in here again soon!! Re-worked the legend again for a better layout. I think it fits together quite nicely now. The new legend layout is more clear, I like it. Was there any discussion as to why Downtown's names are confined to boxes, while other areas not? Otherwise, things are looking good. AndyDufresne wrote: The new legend layout is more clear, I like it. I was trying to make them look a little like buildings, without adding too much depth. They looked weird with the city streets in the background. I can flatten them, but I think they need a solid color behind them. Dropped the buildings/boxes from Downtown, but left the background sans grid. Okay Ladd's Addition as an impassable border is AMAZING. I do think that the key might need to be clearer about that one. I wish we weren't commemorating "Shoe Town," but that's just my bias. It does make that corner pretty powerful having auto-deploys clustered over there. Bike lane mechanic is cool, and really I just love the neighborhoods and such. Uh, so let me get this straight... If I hold two lines I lose one man? If so, seems like a very light penalty for the bonus which is why I think it might not be right. Either way, I think that part where it explains the MAX lines isn't clear. jwithington wrote: I wish we weren't commemorating "Shoe Town," but that's just my bias. It does make that corner pretty powerful having auto-deploys clustered over there. now that the must-see bonuses are auto-deploy, we need to reduce the bonus of the zones in which they're located: sw from +2 to +1, se from +5 to +4 and nw from +3 to +2. ne theoretically goes from +8 to +7 but, when i look at it again so long after the map was stamped for gameplay, even +7 still seems a lot for an 8-region, 6-border zone that contains an auto-deploy: i recommend +5. the max bonuses also seem on the high side when compared with similar bonuses in vancouver and chicago; i wonder whether +3 for yellow and +5 for red or blue are more appropriate (being equal to the number of stations). lostatlimbo, can u note in the opening post the fact that the yellow line has 3 start positions, so that this isn't missed when the xml is compiled?